Lee Unwin: Let it snow! Its hard to see here, but I had to put my racing snowshoes on to walk the dog today, we have almost 2 feet on the ground and its still falling. I went xc skiing for 2 hours yesterday which was great in the woods, but the wind was gusting at over 30mph which made the open areas and the tops of the ridges very,Everesk, I think I just created a new word. 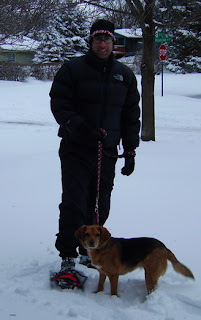 Anyway, walked dog last night in a honest to god Blizzard. Had to suit up in North Face gear, headlamp, face mask and put on moto-cross Oakley goggles just to see. Giant snow thunder and lightning overhead, It was great! 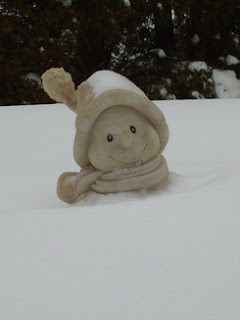 This little snow man who is over 3 feet tall, needs help, he is about to drown in his own snow! More pics after Tuesday, going out for 3 or 4 hour ski that should cook me off like 3 day old bacon grease in a cast iron skillet.